Mal Haakenson was the elder son of Henry and Olea Caroline Haakenson (née Nygaard), born at Bella Coola, British Columbia on 6 January 1919. 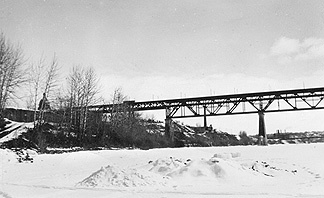 In 1922 the family moved to Berwyn, Alberta, then and today a small rural village of the Peace River region in the mid-North, settled as recently as 1910. In 1941 the village had been formally incorporated for just five years. In the national Census that year, when its population could be shown separately for the first time, the count stood at just 206 persons. A steady gaze and a hint of grin. 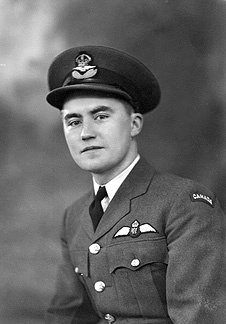 This undated crisply formal portrait as an RCAF officer pilot may have been taken in July 1942, on the award of his wings and commission as Pilot Officer. 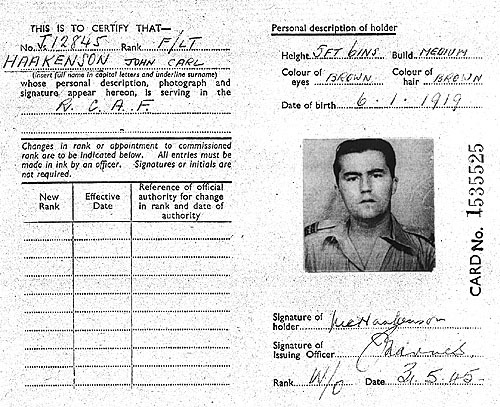 R121717 Aircraftman 2nd Class Haakenson MJCH had enlisted in the RCAF on 13 August 1941 at Edmonton, Alberta. Assessed on entry for possible Pilot or Observer training, as often happened to men on enlistment, AC2 Haakenson was sent home the very next day on one month’s unpaid leave. The Service way: hurry up and wait. Returning to the RCAF Reception Centre at Edmonton in the second week of September, the RCAF system took him in, to be kitted and drilled in the basics of Service life over four weeks at 3 Manning Depot. For good measure, four weeks at RCAF Station East Calgary followed. No rank visible, no wings, no trainee flash—but characteristic stance. Who’s that in the archway? A shared photo op! The absence of aircrew trainee cap flash suggests a date during his time at 3 Manning Depot. On Remembrance Day 1941 he was taken on strength at 4 Initial Training School Edmonton, completing the required courses there in just under eight weeks. At 4 ITS, flying training came a step closer, with lectures in aerodynamics, armament, mathematics, and navigation. An airman’s final selection for further training as pilot, navigator or wireless operator depended on his ITS assessment. In the first week of January 1942, duly re-classified Leading Aircraftman and re-mustered as Aircrew/Pilot, Mal Haakenson’s BCATP flying training began at 16 Elementary Flying Training School Edmonton. RCAF aircrew trainees in Winter (Haakenson collection). AC2 Mal Haakenson third from the right, third row in this undated, uncaptioned shot. Probably 16 EFTS Edmonton, January 1942. The Aircraftmen wear greatcoats and sidecaps with the white flash of aircrew trainees. The Unit’s Wing Commander stands centre, his Flight Lieutenant on the left. Both wear the RCAF officer’s double-breasted greatcoat and the officer’s fur cap worn only in Canada. They are flanked by the Training Flight’s NCOs (a Corporal, left, and Flight Sergeant, right). The front row, officers, NCOs and airmen, all stand in the snow. The trainee pilot’s personal test...can you fly a Tiger Moth below the span? Yes, you can. Against the rigours of the Canadian winter, RCAF C-model Tiger Moths were equipped with a neat canopy and a cabin heater. This classic air-to-air shot points squarely at what it was about flying that appealed to Mal. The landscape below hints at Edmonton. 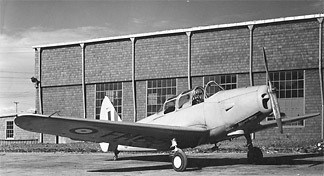 Fairchild PT26 Cornell I, Edmonton c1942 (Haakenson collection). Cormells became the basic trainer of the BCATP, replacing DH.82 Tiger Moths and Fleet Finches from 1942. Passing out at the end of March 1942, he was posted to 3 Service Flying Training School Calgary to complete his flying training on the Avro Anson. 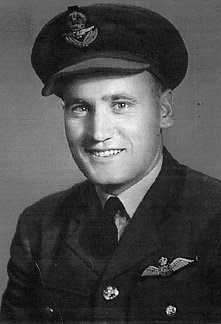 There, on 17 July 1942, 11 months after joining the RCAF and in a blizzard of form filling, signing and rubber stamping, Malfred Johan Carl Haakenson J12845 was awarded his Pilot’s wings, promoted to temporary (paid) Sergeant, and appointed to a commission as Pilot Officer, all in the one day. The posting at 3 SFTS continued until mid August. It may have been at this time that he undertook the twin-engine conversion course, to gain the Cessna Crane endorsement on his record. 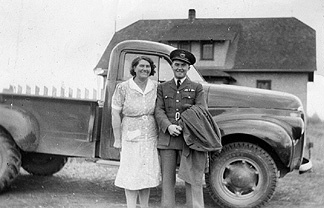 Berwyn August 1942: Pilot Officer Haakenson, his mum - and the new pick-up! A summery shot, with Olea casual in a favourite cotton print dress. In contrast, the Winters of the high plains beyond the Peace River can be guessed at, from the rear tyres of this handy-looking ute. Mal, in Pilot Officer uniform with wings up, was allowed 14 days leave that summer, at the end of his posting with 3 SFTS Calgary. Leave expired, on 15 August it was time to catch the train for the long journey East, to 31 General Reconnaissance School at Charlottetown on Prince Edward Island. There, in the unit’s Avro Ansons, new pilots and navigators undertook the training needed for flying larger twin-engine aircraft on extended coastal operations, ocean patrols and long-range ferrying. Les Wood also trained at 31 GRS, on a slightly later course. 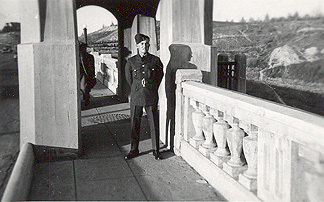 Possibly at 31 GRS Charlottetown in 1942, but also possibly Fort McLeod in 1941. 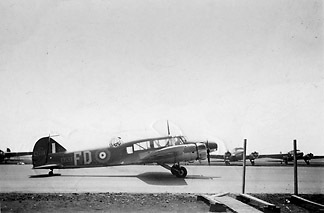 At some point, Anson 6252 FD was on charge at No 121 (K) Squadron RCAF, based at Dartmouth, Nova Scotia. The BCATP Scheme took on large numbers of Ansons—the sedate “Faithful Annie” or, even less glamorously, the “Flying Greenhouse”. The comparatively spacious cabin allowed for several navigators or several wireless operators to undertake air exercises at the same time, and the twin-engine layout allowed for multi-engine pilot training. Initial deliveries were of Mark I aircraft, as here, powered by Armstrong-Siddeley Cheetah IX engines of 350hp. Supply difficulties soon led the RCAF to introduce a distinctly more pedestrian Mark, with 330hp Jacobs engines. A later RCAF Mark was fitted with the 450hp Pratt & Whitneys, which might have made for rather more sprightly performance if not for the increase in cabin trainee places from three to five. The final Marks of this quite modest type remained in RAF service until 1968. “Faithful Annie”, indeed. Possibly 31 GRS Charlottetown in 1942. In the third week of October 1942, on passing out of the notionally 9 week GR course, Mal was given 2 weeks pre-embarkation leave. On 1 November he was taken on to the books of 1Y Depot at Halifax for three weeks, to await passage by convoy to the United Kingdom. Disembarking there on 30 November, perhaps at Liverpool, his voyage may have been by troopship in a TC convoy. The RAF held him at the RCAF Personal Reception Centre Bournemouth for just a fortnight before his initial posting to 132 (Coastal) OTU at East Fortune came through in mid-December. There large numbers of Blenheims and Beaufighters of various marks were on the training roster for long range fighter and coastal strike operations. Another Albertan, Gordon F Trudgeon, son of Francis F Trudgeon and Ada M Trudgeon of Lamont, had also enlisted in the RCAF sometime in the summer of 1941. The pair met up in 1942 as pilots at East Fortune in Scotland, only to find that back home in Berwyn, it was Trudgeon’s brother-in-law and elder sister who had the local pharmacy. Mal and Gordon went on to the same Bristol Beaufighter course in Scotland and became close friends, as will be seen. Both went on to serve with the RAF in India and Burma, Trudgeon with 27 Squadron and Haakenson with 211 Squadron. 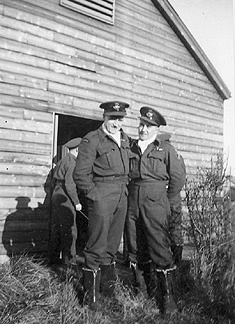 A treasured picture from the family collection, with Mal and Gordon Trudgeon together, perhaps in late 1942 and certainly at RAF East Fortune, some 15 miles East of Edinburgh. 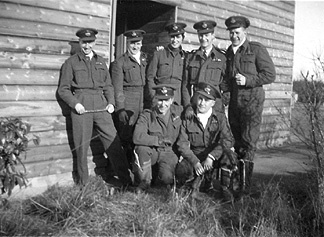 Left to right, rear: P/O Brown RAF, P/O G Trudgeon RCAF, F/O Street RAF, P/O Thomsett RCAF, P/O Hodson RCAF. Front: P/O Flannery RCAF, P/O MJC Haakenson RCAF. A sunny-bright day in East Lothian but still brisk, from the gloves, scarves and flying boots. It was at East Fortune that the two Canadians met. Book-ends! The shot as captioned has aircrew names but undated and without location. P/O MJC Haakenson (listed as “Harkinson”) is first left, front row. P/O Gordon Trudgeon is front row, last on the right—both are qualified pilots. 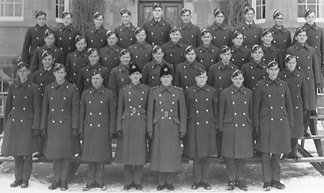 The tall man ten from the left in the rear rank is one Sgt Ferguson, wearing the winged O badge of the Observer, just possibly also destined for 211 Squadron. If so, it is the Scot known to Mal as “Jock”, 1321315 F/Sgt Allan Clark Ferguson, the Navigator/W who shared 21 of Haakenson’s 24 operational sorties. The aircrew are a mix of pilots and observers, both sergeants and officers, under the cheerful eye of F/Lt Nicoll. Seventh from the right, front, is 44073 F/Lt Harry Gandy with DFC and what may be a General Service Medal ribbon. Gandy was originally an Air Gunner of the winged bullet era on Wapitis, who had been decorated in the course of early Blenheim shipping strike operations in the UK. He had remustered as a pilot and was promoted F/Lt on 27 June 1942. By June 1943 Gandy was serving as a pilot with 177 Squadron in India, later as S/Ldr and Flight Commander until Februrary 1944. Changes in aircrew classification in July 1942 brought new badges, authorised from 17 September 1942 (AMO A. 1019/42), including the Navigator’s winged N in place of the Observer’s O. A series of provisions allowed those who had already qualified with the Observer badge to retain it. Well into 1943, newly qualified men were still being presented with their O because nothing else was available! As a rule, having already qualified as aircrew, it was only on starting at an Operational Training Unit (OTU) of some two to three months that pilots and off-siders teamed up as a crew. There were a number of OTUs in Canada, the UK and the Middle East for example, responsible for the final training of Beaufighter crews. 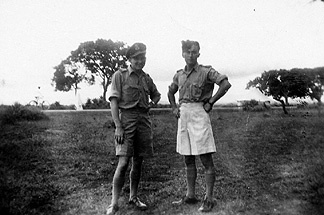 Haakenson and Trudgeon trained in Scotland at RAF East Fortune for about 3 months from December 1942 before their postings to the Far East. The timing, course name and number, and the presence of Ferguson, Haakenson and Trudgeon strongly suggest that this is the final 10 Beaufighter Operations Course shot at 132 (Coastal) OTU East Fortune, around February/March 1943. Today, the airfield is the site of the Scottish National Museum of Flight. Gordon, left and Mal, right. Firmly dated on the rear. Another treasure. A happy sunny shot, possibly from the full kit and light, the same day as the pilot group, above. Promoted to Flying Officer in mid-January 1943, some weeks later Haakenson, at least, went on to another posting with 2 (Coastal) OTU at Catfoss in Yorkshire. Although his RCAF record for the period is partly incomplete, by mid-April his OTU time was done. Posted to No 304 Ferry Training Unit at Port Ellen, near the small town of that name on Islay on the Argyll coast of Scotland, it was down to serious business at last. Collecting a brand-new Beaufighter from Filton, the next two weeks were taken up with flying really long-range legs, at near maximum endurance, with his Nav/W. Very likely it was Sgt Ferguson in the back office of the Beaufighter, tending the radio and keeping a watchful eye on winds, maps and courses. Arriving at RAF Portreath on 3 May, all that remained was for their aircraft to complete a satisfactory fuel consumption test. On 5 May 1943 they were off, ferrying the Beaufighter on the long, long route through the Middle East on the way to an operational Squadron posting in India. Stage by stage, the flight might take 10 days or more depending on any serviceability problems. Posted to India Command on departure, Flying Officer Haakenson’s papers were marked for posting on to 177 Squadron on 12 May. In Silently into the Midst of Things, Sutherland Brown’s account of 177 Squadron RAF in India and Burma, he was one of those listed on the early roll of surplus 177 Squadron aircrew. The dispiriting delays in equipping and manning the growing Beaufighter strike-force in India have been remarked on in that book and a number of other narratives of the time, so it was little surprise to see his record immediately marked as “Struck off Strength 177 Squadron” and shortly after “to AF [Air Forces] in India arr Phaphamau”, dated 7 June 1943. In August 1943, 177 Squadron moved forward from Phaphamau to Chittagong and then Feni. It seems that Mal Haakenson was no longer with them. In the way of the Service, having reached his apparent posting at Phaphamau, near Allahabad on the Ganges in Uttar Pradesh, Haakenson was now to be shunted all the way back across the continent to Poona, 700 miles away as the crow flies, at least 900 miles by road, and an untold number of hours away by train. F/Sgt Red O'Mara (Pilot), left, F/O Graham, middle, P/O Ray Watson (Observer), right. At Bombay, on the West coast of India, Poona was “only” some 90 miles away inland, up on the Deccan plateau. An interesting co-incidence of surnames, with the appearance of Watson, here a Pilot Officer wearing the single wing of the Observer that early Nav/Ws were permitted to retain. The 211 Squadron Medical Officer was also named Watson: already a F/Lt in 1943, John Watson was made S/Ldr by January 1944. 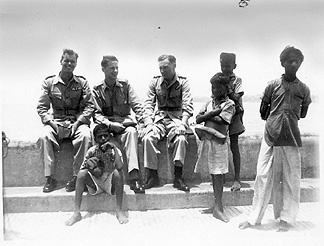 Like other arriving Beaufighter men, Mal was to be “parked” for a period at Air Transit Pool Poona, while India Command pulled the establishment of their new squadrons together. It was 20 September before his posting to 211 Squadron finally came through—back across India to Phaphamau, where the Squadron had been re-formed on 14 August. It was well into September before there were sufficient officers and men present to set up the Officers Mess, the Sergeants Mess and the airmen’s canteen. It was mid October before the first two Beaufighters arrived. The 211 Squadron Operations Record Book (ORB) noted his arrival on 6 October 1943, posted in as Pilot Officer while the Squadron was at Phaphamau. The well-regarded W/Cdr Pat Meagher took command of the Squadron that day, and two days later Acting S/Ldr JSR (Stuart) Muller-Rowland DFC arrived. He would follow Meagher as CO and was likewise well-regarded. The new Squadron was starting to pull together: the first two Beaufighters were flown in on 15 October. A rare print from the working-up period. A heavy, sultry day by the look of it. Heat damage to photo negatives and prints like this was quite common. There was an element of danger in all war-time flying, not just on operations. The Squadron’s working-up period, following a period of comparative inactivity, was thus somewhat tense. From mid October to the end of December, one Bisley and three Beaufighters were damaged, some due to hydraulic problems. More disturbingly, three of the Squadron’s 16 Beaufighters were destroyed in accidents with the loss of five aircrew. From 5 November onwards, the Squadron began to move east to Ranchi, by air, rail and road, arriving on 10 November. At this time, Haakenson fell ill with malaria and was admitted to hospital, one of 16 admissions that month with either malaria or dysentery. They had a lot of trouble with malaria in the first six months. By January he was well enough to undertake a two-week rocketry course at SLAIS. Between the malaria and the training detachment, it was some time before Haakenson appeared again in the Squadron ORB. In Trudgeon, Haakenson had made a firm friend. From Scotland both men had taken to writing letters home, among them, Malfred’s to Gordon’s sister Ada. In Burma, with cool Alberta far away, the correspondence continued. Half a world away from home, their Squadrons were now based within about 40 miles of each other on the great flood-plain of East Bengal. Their roles were much the same: long-range low-level strikes in the pugnacious Beaufighter against the Japanese, an enemy of the fiercest tenacity. Gordon, posted with 27 Squadron to Agartala and then Parashuram, soon had a head start over Mal on operations. On 11 March 1944 he and his navigator F/O Dobson added no less than five to the Flying Elephants’ bag of locomotives destroyed, bringing the unit’s total to 202. Now Flying Officer with 211 Squadron at Bhatpara, Haakenson’s first sortie came on 15 March 1944 with F/Sgt Lightfoot in the rear seat as they took LZ230 'A' on a four aircraft RP attack on a bridge at Lami. All returned safely. The right tactics for rocketry were still being sorted out, and if (like other bridge attacks) the results reported this time were disappointing, it was not too long before more suitable targets and more satisfying results were in hand. By coincidence most poignant, it was on this same day that J20114 Pilot Officer Gordon Foster Trudgeon RCAF of 27 Squadron RAF was lost, aged 22. In Beaufighter VIF EL453 he and George Dobson were shot down by heavy Bofors fire near Taungup, a strongly defended target. They lie together in Rangoon War Cemetery. But for Haakenson the next sorties with 211 Squadron came quickly. On 19 March he was in the air with F/Sgt Jock Ferguson the Scot in Beaufighter X LZ381 'P', and again with Ferguson on 22 March. By the end of the month the pair had completed a fourth trip together, on 28 March in Beaufighter X NE516 ‘Y’. Despite close personal loss, with four operations in their Log Books by the end of March, the two might start to feel some confidence. A graphic image, not least because of the apparent heat damage to the print and perhaps its negative. The aircraft is running up, perhaps waiting for clearance to taxi. The cockpit hood is open. 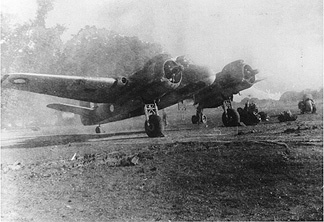 Haakenson was later to recall that when cleared for take-off, Beaufighters occasionally failed to taxi out, with the pilot passed-out in the cockpit. In letters home, Gordon Trudgeon also remarked on the conditions, and putting up with the all-too-easily acquired Prickly Heat. For the first half of April, Haakenson carried on at about the same rate with four more operations, two of them in Y-Yoke, one of them at night, and three in all with Ferguson. Returning to Ramu at night on 10 April from an attack on Chiengmai, the two had a close shave in LZ515 ‘X’. Undershooting in the dark on finals, the aircraft hit a retaining wall, tore off the undercarriage and was subsequently destroyed by fire. Haakenson and Ferguson were uninjured. Four days later they were back on operations. With eight trips up and a very lucky escape under their belts, the pair now had a break. Then came May and the pace was really on. There they carried out no less than 12 sorties that month, all but one of them together, three of them at night, seven of them in Y-Yoke, presumably NE516. Assuming it was the same aircraft, they must have started to feel it was "their" Beau. The ORB summary for May remarks "this month has been an extremely busy one as our efforts were stepped up prior to the monsoon". Indeed Mountbatten, with good reason and RAF support, was about to put aside previous convention so the arrival of the filthy seasonal weather—much rain, wind, thunder and so on—saw little slackening of air effort. And late that month, the Squadron moved to Feni. Both shots taken in clear, low sun, in a shady spot, wearing full and quite spruce uniform. Mal on the left. See also the following sequence. At some point, the boys had got together in fresh uniforms and arranged a number of these paired shots. All were at the same time of day, from the shadow angle and freshness, perhaps early morning. Some were taken in the open, like this one. Mal on the left, Wood on the right: both pilots. Note the tree, left. Visiting her mother in Berwyn in the Summer of 2009, Lorraine Haakenson was able to find another of these relaxed photographs. Here the light has become flat, presumably by passing clouds, though the faint shadow angles are still low. Note the tree, left. 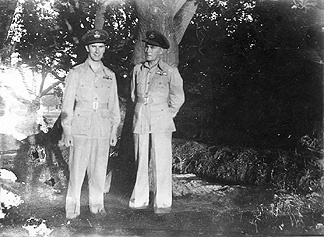 This photograph again shows two aircrew: Navigator Ray Watson on the left, with his winged ‘O’, and George Wood on the right. Here, Malfred named both on the rear of the photo, as in the caption above. The light angles are still low but brighter once more—clouds having passed to the rear. Given the whole sequence of these shots, they seem to have been taken at Feni on the same day. Given the dates of 177 Squadron and 211 Squadron movements vs Mal Haakenson’s posting dates, these seem to be 211 Squadron groups in 1944, rather than 177 Squadron in 1943. It seems that one of these shots with Watson was slightly misnamed at one point, by a slip of memory. Plainly, it is the same man in each shot, and clearly aircrew with his Observer’s winged ‘O’: Ray Watson, from Lorraine’s later find above. One of the men initially noted by Sutherland Brown as 1943 “surplus aircrew” in 177 Squadron along with Haakenson was one P/O RA Watson, an Observer. The Ray Watson in these photographs may very well be he. 132178 F/O Robert Alan Watson RAFVR and Nav/WOp of 177 Squadron, was lost in action on 9 May 1944 with his pilot J21217 F/O RN Peever RCAF. Haakenson, made deputy flight commander, was promoted to Flight Lieutenant on 2 May 1945. In contrast to the preceding shots with the single ring of the Flying Officer visible on the epaulettes, here the two rings of a Flight Lieutnenant can faintly be made out. In the Squadron Operations Record Book, other than the new rank of his sortie entry, there was no note of his promotion, a fairly typical display of ORB terseness in a busy time. On the last day of May, with the Squadron move to Feni complete, came Haakenson’s 20th sortie (18th for Ferguson) albeit not in Y-Yoke but in X-Xray. Quite a milestone, though with plenty more to do before reaching the “tour expired” goal of 200hrs of sorties. In one of his letters home, Haakenson passed on the news that he was the first Canadian promoted to Flight Lieutenant—typically adding that he didn't know what all the fuss was about. With due honour all round, the full picture is rather richer than that, its sharp detail etched by the inevitable brutality of war. The Squadron was notable for its strong Dominion character throughout the war, with Australians, Canadians and New Zealanders all well represented. The first Canadian of the Squadron in WWII was 41000 KCVD Dundas DFC of Pelly, Saskatchewan. Ex RCAF, Dundas had joined the RAF direct in 1938 and was posted to 211 Squadron in the Western Desert in mid 1939. In the dark days of April 1941 in Greece, his Squadron Leader missing in action, Ken Dundas was promoted to F/Lt. In Sumatra by February 1942 as Squadron Leader in charge of half the Squadron, Ken Dundas died with his Blenheim crew during a night raid on Kluang from Sumatra. On re-forming as a Beaufighter strike unit in India, about half the pilots of the Squadron were RCAF men attached to the RAF. In that testing non-operational period at Ranchi in 1943, J8141 JR Edgar RCAF died in a flying accident on 27 December, alone in Beaufighter LZ151. A Flying Officer according to the Squadron record, his Commonwealth War Graves Commission entry was as F/Lt Edgar. In war-time, the time elapsed between application or recommendation and actual approval or gazettal meant that such seemingly retroactive promotions were not uncommon, with the result that Squadron records of the day, especially regarding casualties, might well be one rank out of kilter with the RAF Central Records entry. Now no aircrew of the 1940 to 1942 Blenheim period went on to serve in the Beaufighter Squadron from 1943. The two groups had survived rather different tests and, while equally firm in their regard for "their" Squadron, each sees the other as a rather distinct group to this day. So, then, it is fair to say that Malfred Haakenson was the first RCAF man to be promoted F/Lt on Beaufighter operations with 211 Squadron, while noting with respect the earlier efforts of his lost countrymen. Whatever his inner pride about such an achievement, it is unsurprising he was off-hand about it—a reaction that Dundas and Edgar may have very likely well understood. So in June, monsoon or no, the cracking pace continued with three more successful daytime sorties, all with Jock Ferguson. On the night of 12-13 June in NE516 Y-Yoke, Haakenson and Ferguson took off from Feni at 0330hrs with one other aircraft to attack targets in central Burma and the Mandalay—Rangoon railway. It was their 24th operation. 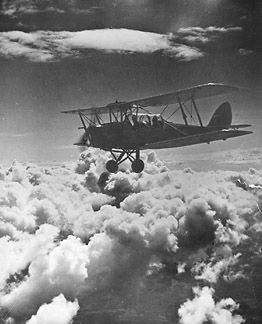 At 0610hrs, somewhere far over Burma, Ferguson was able to get off an SOS signal by VHF and to transmit the long dash seeking a QDM (the radio request for a bearing home). Feni, Chittagong and Cox’s Bazaar all replied, with bearings which placed them somewhere East of Magwe on the wrong side of the Irrawaddy perhaps 350 miles from Feni. Despite the bearings and further calls, nothing more was heard from Y-Yoke: J12845 F/Lt MJC Haakenson RCAF and his Nav/W 1321315 F/Sgt AC Ferguson did not return. 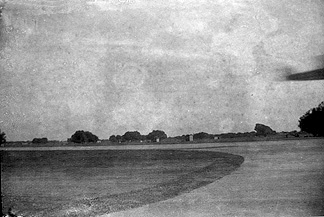 Meanwhile, in D-Dog, F/Sgt Dickinson and his NAv/W Sgt Lacey had encountered monsoon weather so unsatisfactory that they made for the Arakan coast and returned to base after three hours in the air. Posted missing, the Squadron had no news of Haakenson and Ferguson until May 1945. They had been shot down. Wounded himself, Haakenson found that Jock Ferguson took some convincing to leave the aircraft. They did bale out, managing by luck to find each other on the ground, only to end up near their crashed aircraft. 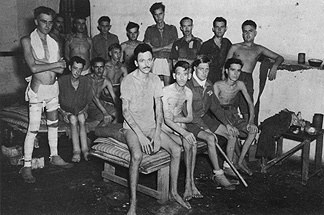 Taken PoW, they were among the 211s to be held under frankly appalling conditions in Rangoon Jail. Both survived. 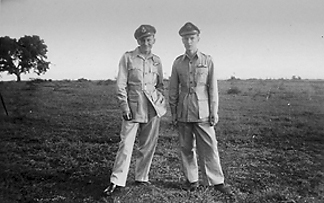 Stubbs and Wackett took a number of other official photographs that day, also in the IWM collection. This particular shot was so graphic that prints of it made their way into a number of personal collections over the years, around the world, in Canadian private archives, and in a number of books on the Burma war. The lanky form of W/Cdr JES Hill is centre rear. He had been a Flight commander with 211 Squadron before a posting to command of 177 Squadron in late January 1944. 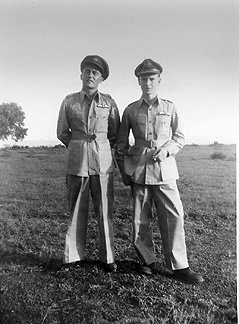 Hill was shot down, with his navigator F/O GW Broughton, on a central Burma sortie on 5 October. Although the standing bandaged figure on the left bears a resemblance to Mal Haakenson strong enough for Ada to be convinced it was her late husband, it is not he after all. The date of the photograph is now certain from the recent IWM update, while Mal and his navigator, F/Sgt Jock Ferguson, were both well enough in April 1945 to be among the group of prisoners selected by the Japanese to be marched from the Jail on 26 April. Jock Ferguson was one of a number to break away from the march and was later reported safe. He returned to Scotland. 402942 Harvey Besley MM RAAF, who went from 72 OTU to 11 Squadron and survived a collision between two Blenheim IVs over Meiktila on 5 April 1943 to fall captive, was another who broke away with a group, giving a telling account in his Pilot, Prisoner, Survivor long after his return to Queensland. In the main party, Haakenson and the others were also soon safe in allied hands, being taken in by advancing Army units who had had news of their presence. 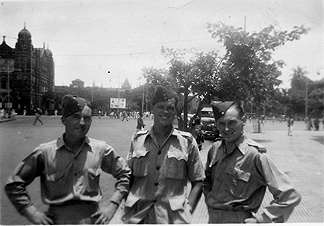 Among the other Canadian survivors of Rangoon Jail were Keith Cuddy of Manitoba, another 211 who had joined the Squadron as early as 26 August 1943; Herb Ivens, a Thunderbolt pilot of 146 Squadron, who stood armed with wooden spear outside the gates of the Jail with Lionel Hudson’s scratch Rangoon Force after the Japanese had quietly withdrawn on 29 April 1945; and one F/Lt Kenneth Wheatley J15781 RCAF, apparently of 77 Brigade. 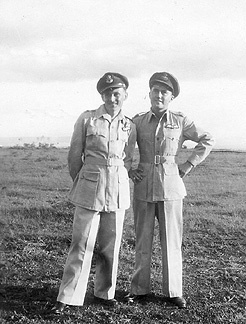 Haakenson and Wheatley were both returned by air to India and hospitalised together at 74 IGH Comilla. The others returned to India by sea. Promoted Flight Lieutenant, 24 Beaufighter strike operations over Burma, shot down, survived the grim pleasures of a year in Rangoon Jail, and Caterpillar Club member. A hell of an achievement. News of Haakenson’s release reached the family in Berwyn on VE Day, 8 May 1945. Other than Muller-Rowland’s kindly letter from the Squadron the day he had been posted missing, they had had no news of him for nearly a year. 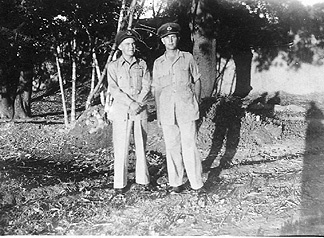 The Far East war had some months to run and Mal spent some of this time at a rest centre in Northern India recovering, where he started writing again to Ada. They must have been good letters. Repatriated to Canada via the United Kingdom, when he got off the train at Edmonton on 23 July 1945 she was on the platform to meet him. Malfred proposed on the spot and Ada accepted. 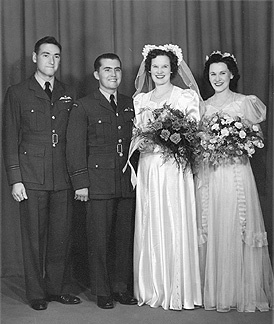 Ken Wheatley was best man at their wedding on 23 August. F/Lt Ken Wheatley, best man, left. Malfred and Ada beaming, centre. Right, her sister and bridesmaid, Thelma. Alberta girls! Mal and Ada made their new life together back in Berwyn, north of the Peace River. Although he had some engaging yarns about Squadron life that he was happy to share with family after the war, like many of his fellow servicemen, Mal Haakenson was little inclined to speak of his service or captivity. Interviewed by the Press on his return to Canada, his assessment of the Japanese and their habit of beating up prisoners wounded or hale was terse: “not at all gentle”. A good farm man with a taste for history and literature, in later years Mal Haakenson found practical answers if the shadows of the past loomed. Occasionally he would up-sticks and travel, with Ada or alone: to England, to Cuba, to visit Keith Cuddy and swap the stories that only servicemen can share. Cuddy passed away in January 1997. 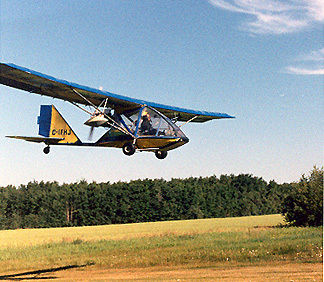 In his 70s Mal took up flying once more, finding peace in the sky at the stick of C-IFHJ, his 1987 Birdman Chinook WT II. At 83 he finally called it a day, but the neat little two-seater is still on the Canadian register. It is thanks to Lorraine and her mother that some account of Mal and Gordon’s war service can be told here, pieced together from treasured photographs, news cuttings, and fondly remembered yarns, rich additions to the detached record of the Squadron’s work and of Mal’s own RCAF Record of Service. Malfred Johan Carl Haakenson of Berwyn, Alberta passed away on 26 February 2006, aged 87. A full life, of humour, warmth and quiet steadfastness. Survived by Ada, his wife and companion of 61years, and their five children, he is much missed. In October 2007, Ada and her daughter Lorraine held a memorial service for Gordon Trudgeon in Lamont. It was well attended and warmly received. After a brief period of illness, Ada Marjorie Haakenson (née Trudgeon) of Berwyn, Alberta, departed this life on 16 September 2010, attended upon to the last by daughter Lorraine and family. Truly, all things must pass. 211 Sqdn Operations Record Book Aug 1943 to June 1944 AIR 27/1302, AIR 27/1303. 211 Sqdn Sortie Reports March 1944 to June 1944 AIR 27/1307. Haakenson MJC J12845 RCAF Form R44(b), Form R230. Haakenson family collection photographs, papers newscuttings.